The ancient Greeks and Romans made extensive use of leather. The Romans used leather on a wide scale for footwear, clothes, and military equipment including shields, saddles and harnesses. Excavation of Roman sites in Great Britain has yielded large quantities of leather articles. 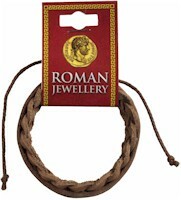 This Roman style leather plaited bracelet is supplied on a card. This Medieval style leather plaited bracelet is supplied on a card. Pewter dolphin supplied on a waxed cord. The information on the reverse of the card describes how dolphins were attributed to Neptune and appeared on art, architecture, mosaics and jewellery. Roman Owl of Minerva supplied on a pin with clasp. The information on the reverse of the card explains how coins were used to communicate, about Roman houses and about Minerva. Pewter dolphin gem ring supplied in a clear blister on an information card which explains about Roman jewellery and the cloths the Romans wore. Gold Plated pewter snake ring supplied in a clear blister on an information card which describes how the snake design was popular throughtout Roman times. Gold Plated pewter dolphin gem ring supplied in a clear blister on an information card which explains about Roman jewellery and the cloths the Romans wore.